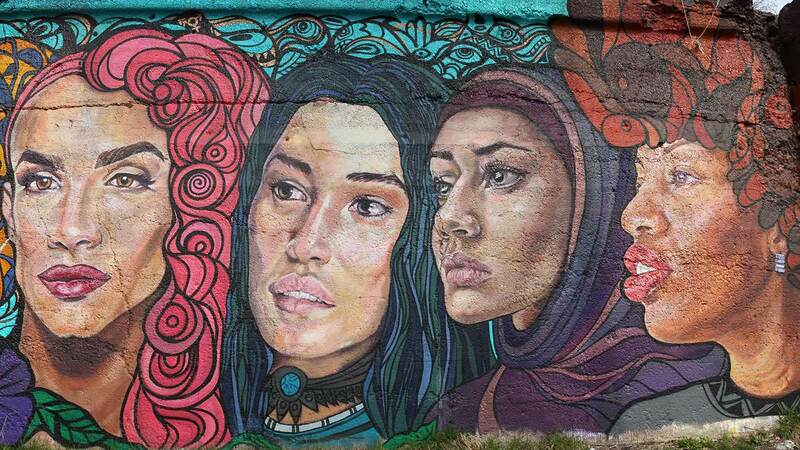 Pilsen is known in Chicago for its public art and, in particular, its many colorful and distinct murals along 16th Street and beyond. Murals distinguish the neighborhood as a center not only of Mexican culture but of creativity and self-expression. What began in the late ’60s as efforts by Mario Castillo, Ray Patlan, and Marcos Raya to oppose the Vietnam War and unify, inspire and educate Mexican-American residents about their proud heritage has more recently gone mainstream, becoming a line item for several new businesses and a canvas for regional artists’ commissioned works. Meanwhile, famous local muralists like Hector Duarte have found international acclaim and brought their large-scale public art to viaducts and buildings from Indianapolis to Caurio de Guadalupe, Michoacan, Mexico. At the same time, another local muralist, Jeff Maldonado has formalized his efforts to inspire young people to create murals through his J-Def Peace Project, sponsored by After School Matters. As Maldonado says, "This community is changing, and it’s evident by the type of murals being painted." See the evolution of Pilsen’s murals in the virtual tour below. Photos by Ken Carl and Kaitlynn Scannell. FEDZ, 1416 W. 18th Street, 2009. Delilah Salgado, Pablo Serrano, Latinos Progresando, 1100 W. Cullerton Street, 2010. Ricardo “NACO” Gonzalez, 1815 S. Paulina Street, 2015. Raul “Rawooh” Ramirez, 1447 W. 18th Street, 2016. Manuel “MATR” Macias & Brenda “KOZMO” Lopez, 1447 W. 18th Street, 2016. Brenda “KOZMO” Lopez, 1449 W. 18th Street, 2016. Amuse, 1448 W. 16th Street, 2013. Layqa Nuna “Lunar New Year” Yawar, 2001 S. Carpenter Street, 2015. Hector Duarte, 1900 W. Cullerton Street, 2005. Manuel “MATR” Macias & Brenda “KOZMO” Lopez, 1453 W. 18th Street, 2016. Alejandro Medina, 1639 S. Allport Street, 2013. Jo Dufo, 1438 18th Street, 2016. Ashley “Michelle_Sllim” Mills, 1715 S. Laflin Street, 2016. Max Sansing, 1686 W. 16th Street, 2013. Joseph “Sentrock” Perez & JC Rivera, 1682 W. 16th Street, 2016. Yollocalli Arts Reach, 1544 W. 18th Street, 2011. Rodrigo “Solo” Mireles, 1752 W. 16th Street, 2012. Brooks Golden, 1754 W. 16th Street, 2012. Francisco Mendoza, 1706 W. 18th Street, 1993. C3PO, 1452 W. 16th Street, 2013. En Masse, Brooks Golde, Lady Lucx, Revise, CZR, JC Rivera, Sam Kirk, 1416 W. 16th Street, 2013. Lady Lucx, 1468 W. 16th Street, 2013. Nice One, 1484 W. 16th Street, 2012. Hebru Brantley, 1478 W. 16th Street, 2013. ROA, 1539 W. 16th Street, 2012. Ricardo Gonzalez, 1790 W. 16th Street, 2012. Rebecca Ray, 1792 W. 16th Street, 2012. Uriel Correa, 1778 W. 16th Street, 2013. Ava Grey Collective, 1762 W. 16th Street, 2012. Mike Davita & Collective, 1760 W. 16th Street, 2012. Sam Kirk & Eva Cancino, 1724 W. 16th Street, 2013. CHema Skandal, 1694 W. 16th Street, 2012. Manuel “MATR” Macias, 1674 W. 16th Street, 2016. Unknown, 1650 W. 16th Street, 2016. Ruben Aguirre & M. Del Real Ink Art Collaboration, 1589 W. 16th Street, 2013. RAE, 1579 W. 16th Street, 2012. Yollocalli Arts Reach, 1515 W. 16th Street, 2012. Jack Chappel, 1507 W. 16th Street, 2012. Jon Burgerman, 1503 W. 16th Street, 2012. Justus Roe, 808 W. 16th Street, 2013. National Museum of Mexican Art, Elevarte, The Resurrection Project, 814 W. 16th Street, 2012. POSE x Dabs & Myla, 882 W. 16th Street, 2013. GATS, 922 W. 16th Street, 2013. Erik Burke, 918 W. 16th Street, 2012. Brett Flannigan & Cannon Hill, 901 W. 16th Street, 2013. The Lost Cause, 1001 W. 16th Street, 2014. Mr. Penfold, 1003 W. 16th Street, 2013. Stinkfish, 1005 W. 16th Street, 2013. The Yok & Sheryo, 1011 W. 16th Street, 2013. Reyes, 1015 W. 16th Street, 2012. Viktor Valášek, 1101 W. 16th Street, 2015. Jeff Zimmerman, 2039 S. Wolcott Ave, 2007. Joseph “Sentrock” Perez & Yollocalli Arts Reach, 1903 S. Wood Street, 2016. Jimmy Longoria, Oscar Moya, Marcos Raya, Robert Valadez & Salvador Vega, 1450 W. Cermak Road, 1979. Manuel “MATR” Macias, 1483 W. 18th Street, 2016. Jeff Zimmerman, 1548 W. Cullerton Street, 2005. Jeff Zimmerman, 1604 W. Cullerton Street, 2005. Francisco Mendoza, 1706 W. 18th Street, 1998. Aurelio Diaz & Sam Kirk, 1300 W. 18th Street, 2016. Gabriel Villa, 2314 W. 18th Street, 2014. Sam Kirk & Sandra Antongiorgi, 1316 W. 16th Street, 2016. Jeff Maldonado & J-Def Peace Project, 1719 S. Paulina Street, 2014.